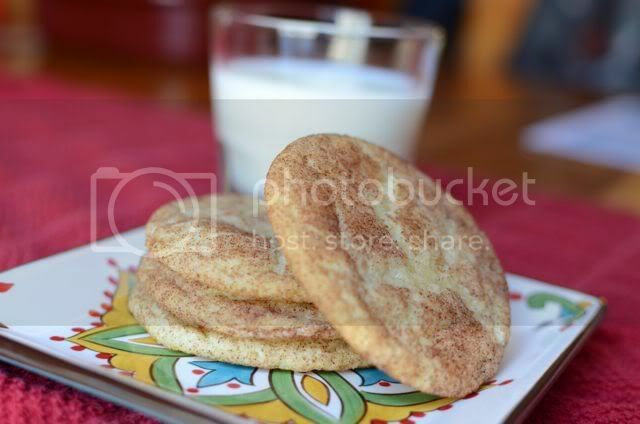 Shrinking Kitchen // Desserts // Don’t Touch My Snickerdoodle! Bet you didn’t guess that these little beauties only have 90 calories each! I was thumbing through my Betty Crocker Cookies & Bars Recipe Cards mag, and came across these. Honestly, I love that all the nutritional info is listed for every recipe. Some of them were very *ahem* jaw dropping. Whip up a batch of these and you’ll be snickering all the way to the scale. Heat the oven to 400˚. In large bowl, beat 1 1/2 c sugar and eggs with electric mixer on medium speed (or with wooden spoon) until well mixed. Let your kids stir in with a wooden spoon: flour, cream of tartar, baking soda, and salt until mixed. In a small bowl, mix remaining sugar with cinnamon. For each cookie, shape dough into 1 1/4 ball (about 2 Tbsp). Roll balls in cinnamon-sugar mixture. On ungreased cookie sheets, place balls 2 inches apart. Bake 8 to 10 minutes or until set. Immediately remove to cooling rack. My note: do not overbake! You don't want them to be brown. Feingold friendly with approved ingredients!! Ummm, I have all of the ingredients out and the sugar and eggs mixed, but then I realized that the directions do not specify when to mix in the butter! HELP! I am making these cookies for a party tonight! Cream butter and sugar together. Then mix with eggs. Usually the ingredients are listed in order by what you need to do first.